Simple & Sincere: New projects coming soon! Hello and happy July! I know that I've been away for awhile and I appreciate your patience - really, I do. And thanks so much to those of you who checked in to make sure I was OK. Yes, all is well... just very, very busy. I am always amazed at how transitions like going from the school year to summer vacation can be so time consuming, and that is what has taken most of my time and energy the last several weeks. As much as I love stamping, my kiddos come first, and that's where I've needed to focus my attention. That being said, I am excited to get stamping again, and I NEED to get stamping again, for my own personal well-being. 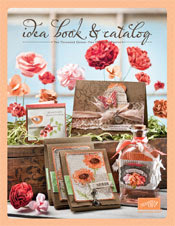 :) I LOVE, LOVE, LOVE the new catalog and I can't wait to share some of the fun, new products with you. So, hang in there! I'll be back soon with some goodies for you. Missed your beautiful creations. Glad you are back. Forgot to putmy name on the above comment.